If that happens, then what will Gosho do differently? Well first of all, the repercussions might be more detrimental, since this would imply to the drugger(if they indeed meet) that APTX doesn't always kill. Other than that, it's all about context and what kind of problem her reverting back to her original form would momentarily solve. Shiho's was to escape(but accidentally encountered Gin),.. Mary's could be more in line with Shinichi's usual dilemma... preventing the shrinking from being discovered. A more unique and fitting route would be that her goal will be to fight off the drugger in order to keep her daughter out of harms way(which would further emphasize her physical tendencies, like how she handled scolding her son). 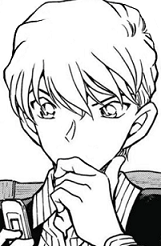 DCUniverseAficionado wrote: Yeah, it seemed really strange for her to suddenly be on him like she was in the last suspicion arc (479–483/398–400), and then for her to just drop it so quickly—to me, this is Gosho reminding us that, yes, Ran's suspicions are in play... and it's just a question of when they will come into play. I don't remember about what this ancient case was, but I think it was pretty natural for me that she easily dropped the subject in the current case. She first was happy that Shinichi demanded an answer (which means he really cares about it and her), and second that he explained himself in that TXT message. He didn't disappear without saying a word. Finally, she was happy she was able to kiss him. They're not a pair yet, so they don't kiss each other every now and then. This was a special kiss and for it she thought she might forgive him this one time. She already got enough happiness for today. I'm still not entirely sure that the level of forgiveness is right, but your post does make me at least appreciate reason Ran may feel that way at the moment, so well spoken. Guess you must've really considered it a dud if a case from this year is "ancient." Especially considering how small of a time period 8 months is (this "ancient" case came out in January 2017—it's now September 2017), in the context of DC's overall length. The "(479–483/398–400)" sounded pretty ancient, You know.. . I wrote that while I was at work, so I didn't really check about what it was. Nemomon wrote: The "(479–483/398–400)" sounded pretty ancient, You know.. . It actually is. 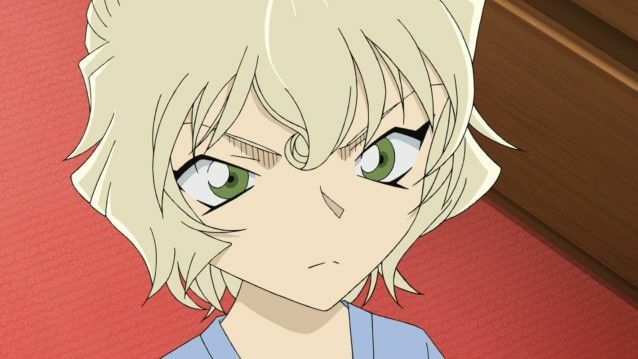 But it's still very relevant, since it actually showed Ran's thoughts and her possible motivation not to confront Conan directly. Oh, so you weren't talking about 984–986, there. My bad. I've been rereading some old stuff and the Kyoto Arc during the past days and I want to go through a bit Shinichi's "hickups" during the latest case. Yeah, one single slip up (forgetting his voice changer under the pillow), let to lots of trouble. Not only that speaking Kansai Ben was highly suspicious (specially when only a few hours later the gang meets "Mr. Kansai Ben, Shinichi's Best Pal" Heiji Hattori himself. ), but then saying "It was my voice, but it wasn't me!" And then, Masumi starts poking in the wound by mentioning that Shinichi folded his sleeves like a little kid would do. Heck, he can really be glad that Ran started talking about the movie poster. Ok, Shinichi, you have really been Conan far too long. Seriously, changing into "Conan Mode" RIGHT IN FRONT OF RAN AND CO.? And then look at their faces. 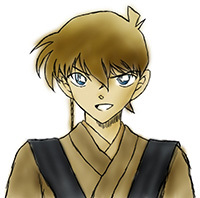 While it wasn't the first time, that Shinichi slipped up when he was himself again (Calling Ran , "Ran Nee Chan" once, during the Desperate Revivval), this time it was almost as if he's holding up a big sign in front of him with "Hello, I was Conan Edogawa all the time". S.Vineyard wrote: I've been rereading some old stuff and the Kyoto Arc during the past days and I want to go through a bit Shinichi's "hickups" during the latest case. Well to be honest, you have to think about that in the DC "reality" there actually is no official way of shrinking/de-aging, just like in our world. So for people like Ran it is hard to believe smth. like that happened/can happen. For people like Masumi/her mother/other people that know about it, it is way easier. So even if Conan/Shinichi slips and gives hints about him being shrunken, it is still not that easy for Ran to be very suspicious, especially after Shinichi made himself appear while Conan was there too (Haibara in disguise, Kaito as Shinichi). What I want to say is that YES there are reasons for Ran to start thinking about shrunk Shinichi, but there is also no evidence for her to actually be sure, especially (as mentioned before) after Shinichi tricked her few times into making her think that Shinichi and Conan cannot be the same by appearing at the same time. @Drug: But strangely, Ran actually came up with that solution rather quickly (File 134 and 258). Last edited by S.Vineyard on October 7th, 2017, 5:19 pm, edited 1 time in total. Ran Mori (File 481, Page 4) wrote: I bet he set up some kind of trick! She even thought that Conan was Shinichi, for a period of time (134–256/96–191), and look how suddenly she got suspicious of Shinichi/Conan, when Eri was abducted (984–986). The only reason it would seem she's been truly fooled, and the subject is done with, is because it's been over 13 years since she got a suspicion arc—because of DC's pacing, and a focus on other characters. Look how Ran remembered her encounter with Vermouth (429–434/345) during a case last year (954–957/866–867), after 500 Files/Episodes—after 13 years—of not doing so. DC's pacing makes so much a question of just when something will happen/come up, not if something will happen/come up. If it benefits the story, Gosho specially goes a certain route even if it has lots of detours. And I just can't imagine he has done all these hickups in the latest case just for fun. For now, finishing up the next Puzzle Piece of the Akai Family Storyline is imo. the next on the priority list. For what it's worth, but Red Thread has posted these interesting thoughts on FB. Before the 1000 series started, we encouraged some speculation on the upcoming files and asked your opinion on which among the many beautiful sites in Kyoto would become the next Conan #landmark. Among the most suitable locations, many of us had suggested the #Kiyomizu Temple as some likely destination for students on a school trip. And we were right, Kiyomizudera served as a perfect setting for the tengu legend Aoyama adapted into a leitmotiv for this case, while the bloody ceiling and crimson leaves provided for nice touches to "color" the atmosphere and convey the most befitting mood. When we hypothesised about this place possibly becoming important for the series and the location plausibly hosting a turning point for Shinichi and Ran's realtionship, however, we still knew very little about the purpose and true meaning behind this choice. While the above mentioned reasons are all absolutely legit and the place being acknowledged as a UNESCO World Heritage site could only add further merit to it, the metaphor Kiyomizudera wonderfully depicted in this case and the story as a whole still probably takes a step beyond all that. The iconic expression “to #jump off the stage at Kiyomizu” is actually the true meaning behind it: a Japanese equivalent for the English expression “to take the plunge”, which figuratively means "to do something daring" or "to commit to something". And that's precisely what happened there, when both Shinichi and Ran "dared" take the next step in their relationship, a courageous jump into the depths of an unknown territory for both of them, with no hooks or certainties to safekeep them from falling, just love as a driving force, providing some solid wings to survive the plunge and fly towards new highs, in order for their commitment to become concrete and for their future as a couple to finally start. "How'd it feel, the kissing sensation?" asked Nakamichi to Ran at the end of the arc. "It was like taking a leap off the Kiyomizu Temple stage" was Ran's answer. Another bump, with a personal thought of mine. As I already said, I believe that the "Ran's birthday" Case will most likely be in 2019, since it's the year of the 25th anniversary of the Manga. This makes me think that this case will be released between January (Date of the Shonen Sunday Debut) and June (Date of the First Volume Release) 2019. Being "soon" isn't an issue for me though. I expect Ran's birthday would fall on days of Tanabata festival, given that there has been no case involved it yet. Plus it would offer some sweet irony that the couple Hikoboshi and Orihime in the story related to this festival get some help from a flock of magpies to meet each other once each year.